ReliaMed Brand is now Cardinal – Same Great Quality, With a Whole New Look! AllegroMedical.com presents The Cardinal Latex Powder-Free Exam Gloves. 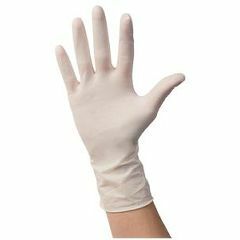 The Cardinal Latex Powder-Free Exam Gloves are Nonsterile, ambidextrous, natural rubber latex examination gloves, powder-free to eliminate powder induced irritation. Textured finish with high tensile strength and beaded cuff to prevent roll down. Comfortable. Lightweight. Safe. Washes Well. Versatile. Good Fit. Work. Home. Following Surgery. Emergency. Hospice. Good Fit. Comfortable. Easy Storage. Lightweight. Safe. Versatile. Hospice. Elderly. Emergency. Following Surgery. I love these gloves for doing wound care. These gloves are the best. Fit well. Good Fit. Comfortable. Sturdy. great product. good price. Hospice. Home. Elderly. good for caregivers. I would definitely recommend this product. Good quality and good price. I need gloves that fit tight around the wrist to keep water out.